Green preparation of heavy metal saponin complexes has been successfully optimized by direct combination between crude extract of Olea Europaea and Citrus Aurantium with divalent heavy metals, Pb2+ and Cd2+. The main operating factors affecting preparation process were investigated and evaluated in terms of setting time, heavy metal ion concentration, crude extract concentration, and pH value of the medium. Saponin complexes had been prepared using the optimum concentrations of heavy metal ions (120 ppm) and optimum concentration of crude extract (600 ppm) in the slightly alkaline medium. The presence of saponin in plants was confirmed by chemical tests and UV/Vis analysis. Amount of prepared saponine complexes has the order: (Pb/Olive) > (Cd/Olive) > (Pb/Citrus) > (Cd/Citrus). In this process, saponins was isolated and heavy metals were eliminated by a simple, faster and without a huge amount of solvents. The process itself seems to be green isolation of saponins from plants, green removal of heavy metal from aqueous waste streams or green preparation of heavy metal saponin complexes. The process exhibits several advantages and hence benefits, among of them are shorter setting time, higher volume reduction factor and no chemical or solvents used. Direct combination between heavy metals solution and plant extract solution to prepare saponin complex could be considered three in one process. During preparation of the complex, saponin isolated or extracted by heavy metals and the heavy metal eliminated or removed by saponin solution. Saponins are naturally occurring glycosides of steroids, alkaloids and triterpenoids. They are found in more than 500 kind of plant kingdom. Different families exhibit strong positive test of saponin such as: Liliaceae, Dioscoreaceae, Solanaceae, Sapindaceae and Agavaceae, so it may be considered as a good source of natural saponin. An aqueous solution of saponin produces foam with shacking but an alcoholic solution inhibits it’s foam property. Saponins in pure solid state are an amorphous, and having high molecular weight. They can be usually extracted using two techniques: (1) liquid – liquid extraction/partitioning or (2) column chromatography. In the first technique, n-butanol is a good solvent for saponin extraction from aqueous solutions. In the second technique, silica gel (SiO2) or alumina (Al2O3) are the adsorbent phase and a mixture of chloroform and methanol as mobile phase for separation of saponin. Recently, high performance liquid chromatography (HPLC), gas chromatography (GC), sephadex chromatography, paper chromatography and thin layer chromatography (TLC), can be used for isolation of saponin. Complete chemical structure of saponin were elucidated by: ultraviolet (UV), infrared (IR), proton/carbon nuclear magnetic resonance (1H NMR - 13C NMR), and Mass spectroscopy (MS) . Saponins possess several biological activities such as antioxidant, immunostimulant, antihepatotoxic, antibacterial, anticarcinogenic, antihypoglycemic, and antimolluscicidal [2-4]. Saponin extracts have been used to improve the feed efficiency for cattle and lambs . The aglycone or non-saccharide portion of the saponin molecule is called the sapogenin. Depending on the type of sapogenin present, the saponins can be divided into three major classes: triterpens glycosides, steroid glycosides, and alkaloid glycosides as shown in Fig. 1 . Triterpens glycosides are normally hydroxylated at C-3 and carboxylated at C-28. Saponins have surfactant properties, so that they can be used as important agents for heavy metal removal for aqueous wastes and remediation of contaminated sites. Since saponins have been served as a natural chelating agent to eliminate problems due to several heavy metals such as: Cr, Cd, Cu, Pb, Zn, and As from soil and waste water [6-9]. Extraction of saponin has been performed using water or polar organic solvents like methanol, ethanol and n-buthanol by immersion of the leaves of the plant for 18 to 72 h, even for 15 days, and by elimination of lipids and fats/oils by extraction with non-polar solvents like hexane or petroleum ether . Some authors have hydrolyzed saponin extracts by acidic medium for characterizing them like sapogenins and thus avoid a probably interference of other compounds. Saponin removes heavy metals effectively from soil by desorption, ion exchange or complex formation mechanism. It was also demonstrated that heavy metals were retained due to some form of complexation with carboxyl group in saponin . Stronger bond between the metals and saponin as a complex must be responsible for metal removal from soil and aqueous solutions [12, 13]. Conventional methods of extraction and purification of saponins have some disadvantages. They require mainly longer extraction time, large amounts of solvent, and may have lower efficiency. Compared to traditional methods, isolation of saponins by heavy metals have many advantages, such as shorter extraction time, no solvent required, and higher extraction rate. The objective of the present work is using the direct combination technique simultaneously: (1) to investigate the green method for the preparation of heavy metal saponin complexes, (2) to isolate saponines from Olea Europaea (Olive) and Citrus Aurantium and (3) to remove and/or eliminate heavy metal using plant extract. Setting time, the effect of heavy metal concentration, effect of crude extract concentration and pH were studied to optimize the green preparation method. Leaves of Olea Europaea (Oleaceae), Citrus Aurantium (Rutaceae) and Ficus Carica (Moraceae) were collected during spring 2015 from Tripoli region, Libya. The leaves of the three plants were cleaned with tap water followed by deionized water to remove dust and dried in the shade at about 30°C and then cut it off to small pieces before extraction. All reagents used in this study were analytical graded and used without further purification. De-ionized water was used in all experimental investigations. Silver (I) acetate CH3COOAg, Manganese (II) chloride tetrahydrate MnCl2.4H2O, and Mercury (II) chromate HgCrO4 are from MIDLEKS EST, GENEVA. Cadmium (II) nitrate tetrahydrate Cd (NO3) 2.4H2O and zinc (II) sulfate hyptahydrate ZnSO4.7H2O are from LANCASTAR, ENGLAND. Lead (II) acetate Pb(CH3COO)2 is from SURE CHEM PRODUCTS LTD, ENGLAND. Nickel (II) chloride hexahydrate NiCl2.6H2O and cobalt (II) chloride hexahydrate CoCl2.6H2O are from BDH. Petroleum ether, n-hexane and absolute ethyl alcohol are from MERCK.UV/visible (UV/Vis.) spectrum of different prepared heavy metal saponin complexes was carried out using Shimadzu UV–Visible spectrophotometer model160A, JAPAN. At first, fat and lipids have been removed from plants using petroleum ether (60-80°C) followed by n-hexane. Aqueous and ethanolic crude extracts were individually prepared from about 500 g of each plant by digestion of the plant materials with a desirable amount (~ 600 mL) of the solvent in 2 L glass beakers at 55°C in a thermostatic water bath for 6h. The extract solution, was cooled and stored overnight at ambient temperature, then separated via decantation and evaporated to almost dryness. The crude extract residue was weighed and tested for the presence of saponin .The heavy metal saponin complex was prepared by direct combination between the heavy metal aqueous solution and the crude extract solution of Olea Europaea and Citrus Aurantium with appropriate concentration in a 100 ml graduated glass cylinder. Some complexes were prepared in a very low acidic medium, and the others were prepared in neutral or slightly alkaline medium. Once the flocks of the complex formed, it starts to settle down in the bottom of the cylinder. The volume and dry weight of the prepared complexes depends on setting time, the type of plant, the type and concentration of heavy metal, and pH value of the solution. Different investigations were carried out during the preparation of heavy metal saponin complexes to optimize the preparation process. In brief, setting time was investigated by measuring the volume (mL) of the precipitate with time (min.) that required for the flocks of the complex to separate and precipitate completely from the solution. The influence of heavy metal concentration (ppm) on the complex formation was studied by using different concentrations of heavy metal and the weight (mg) of dry complex was measured as a function of concentration. Also, the effect of concentration (ppm) of ethanolic extract and pH value on the preparation of heavy metal saponin complex was investigated in terms of the weight and the volume of the prepared complex respectively. Fig. 2 shows the heavy metal saponin complex during settling down to the bottom of the cylinder. The differences in absorbance may reflect the differences in the degree of coloration of the prepared complexes. Heavy metal saponin complexes were prepared using the direct combination method between aqueous extract of Olea Europaea and Citrus Aurantium with different heavy metal ions. Experimental set up and the obtained results were summarized in table 1 which show that the medium of the crude extract solution is weak acidic (pH = 5.16 and 6.35) that may be due to the founding of triterpenoid saponin as organic acid containing carboxyl group (-COOH) at carbon number 28. The above mentioned fact support the presence of triterpenoid saponin such as Oleanolic acid and Hederagenin as shown in Fig. 4 . This Fig. represents the organic part of the heavy metal saponin complex. Six heavy elements only (Pb, Cd, Mn, Co, Ni, and Zn) succeeded for the preparation of saponin complexes while, Hg and Ag were failed along a wide/broad range of pH values (5.16-10.5) for both plants. Succeeded heavy metals would divide into two categories: the first group which precipitated with saponin in the slightly alkaline medium. This group involves Pb, Cd, and Ni. The second group which is precipitated at pH values of the crude extract of the plants (weak acidic medium), and this group involves Mn, Co, and Zn. The final volume of wet complexes after adequate setting times varied from the minimum volume ≈ 7 mL (for Mn & Co) to the maximum volume ≈ 23 mL (for Ni). The final setting time varied from 80 to 135 min. In general, setting time and the volume of the prepared wet complexes are closely related to each other for both Olea Europaea and Citrus Aurantium. Nickel has the highest values of the volume and setting time. This result reflects that the density of nickel – saponin complex is different completely from that, any other metal – saponin complexes and it may be explained by precipitation of other organic compounds rather than saponin with nickel. For some unknown circumstances, saponin itself may be not precipitated with nickel. From table 1, lead (Pb) and cadmium (Cd) were chosen for more investigations while silver (Ag), mercury (Hg) and nickel (Ni) were excluded due to its low reactivity towards saponins. Manganese (Mn), cobalt (Co) and zinc (Zn) also excluded due to its low availability and durability in different industrial waste streams. Accordingly, VRF for the removal of the heavy metal process was calculated and was found to be equal to 6.25 which is considered a relatively high volume reduction value. The more efficient decontamination process is associated with the higher VRF and vice versa. The above mentioned result is in agreement with the test of saponin in table 1 and may be attributed to the fact that Olive leaves is more rich in saponin than Citrus leaves . Also, lead and cadmium ions with low concentration (below 120 ppm) can successfully remove from its aqueous solutions by natural saponin via direct precipitation/flocculation method. Relatively high concentration of crude extract that required for the elimination of heavy metals may be due to the presence of so many numerous high molecular weight compounds in Olea Europaea (Olive) and Citrus Aurantium as a natural product rather than saponin such as falvonoids, rotenoids, terpenoids, tannins, chalcons, and alkaloids . Influence of pH value on the volume of saponin complexes was studied with different systems and the obtained results was drawn as in Fig. 12 which show that highly acidic and/or highly basic medium is not the favorite medium for the preparation of heavy metal saponin complexes. These results reflect the over sensitivity of the natural products towards severing conditions. Chemical destruction of the natural products like saponin may be the predominant and probable actions in the presence of hydrogen ions [H+] or hydroxide anions [OH-] in very high concentrations. In general, the volume of saponin complexes prepared in strong acidic or alkaline medium is less than that prepared in the slightly alkaline. The maximum yield of the prepared saponin complexes appears between pH ≈ 9-11. The general behavior in Fig. 12 seems not affected by the type of plant or/and the type of heavy metals only, but affected also by the pH value of the medium. The maximum volume is in the range 15-20 mL and was obtained at pH = 10.50±0.05. (Pb/Olive) > (Cd/Olive) > (Pb/Citrus) > (Cd/Citrus). In this process, (1) saponins were isolated faster than traditional chromatography techniques (2) heavy metals have been removed by saponin (3) a chemical complex have been prepared by direct combination between heavy metal and saponin So, the process may consider to be a simple and green way for the preparation of heavy metal saponin complexes. The authors would like to express appreciation and thanks to Dr. SHAZA MAHER MOHAMED, Faculty of Medicine, University of Tripoli for her valuable support in formatting of tables and Figures. 1. Negi J, Negi P, Pant G, Rawat M, Negi S. Naturally occurring saponins: chemistry and biology. J Poison Med Plant Res. 2013;1:006-11. 2. Hostettmann K, Marston A. Saponins: Cambridge University Press; 1995. 3. Vincken J-P, Heng L, de Groot A, Gruppen H. Saponins, classification and occurrence in the plant kingdom. Phytochemistry. 2007;68(3):275-97. 4. Marston A, Hostettmann K. Review article number 6: Plant molluscicide. Phytochemistry. 1985;24(4):639-52. 5. Romero-González J, Peralta-Videa JR, Rodríguez E, Delgado M, Gardea-Torresdey JL. Potential of Agave lechuguilla biomass for Cr(III) removal from aqueous solutions: Thermodynamic studies. Bioresource Technology. 2006;97(1):178-82. 6. Kiliç E, Font J, Puig R, Çolak S, Çelik D. Chromium recovery from tannery sludge with saponin and oxidative remediation. Journal of Hazardous Materials. 2011;185(1):456-62. 7. Hong KJ, Tokunaga S, Ishigami Y, Kajiuchi T. Extraction of heavy metals from MSW incinerator fly ash using saponins. Chemosphere. 2000;41(3):345-52. 8. Schmoll O HG, Chilton G and Chorus I. Protecting groundwater for health: Managing the quality of drinking-water sources: World Health Organization; 2006. 697 p.
9. Gonzalez-Valdez LS, Almaraz-Abarca N, Proal-Nájera JB, Robles-Martinez F, Valencia-Del-Toro G, Quintos-Escalante M. Surfactant properties of the saponins of Agave durangensis, application on arsenic removal. International Journal of Engineering. 2013;4(2):8269. 10. Lamidi M, Martin-Lopez T, Ollivier E, Crespin-Maillard F, Nze Ekekang L, Balansard G. Separation of saponins and determination of quinovic acid 3-O-α-L-rhamnopyranoside fromNauclea diderrichii (de Wild) Merr. Bark by high performance liquid chromatography. Chromatographia. 1995;41(9):581-4. 11. Lidi Gao NK, Yuichi Sato, Chong Li, Shuang Zhang, and Hiroshi Imaizumi. 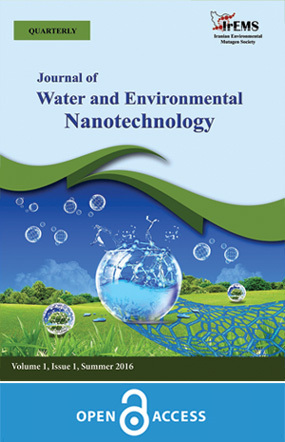 Behavior and Distribution of Heavy Metals Including Rare Earth Elements, Thorium, and Uranium in Sludge from Industry Water Treatment Plant and Recovery Method of Metals by Biosurfactants Application. Bioinorganic Chemistry and Applications. 2012;2012:11. 12. Gusiatin ZM, Bułkowska K, Pokój T. Tannic acid as a cost-effective substitute for saponin in soil remediation. Environmental Biotechnology. 2014;10:66-72. 13. M. Munichandran BG, P. Latha and Gurijala Ramakrishna Naidu. Studies on the Reduction of Lead And Cadmium From Aqueous Solutions Using Citrus Pennivesiculata (Gajanimma) Peel. Journal of Applicable Chemistry. 2016;5 488-96. 14. Astuti SM, Andayani R, Risch A. Determination of saponin compound from Anredera cordifolia (Ten) Steenis plant (binahong) to potential treatment for several diseases. Journal of agricultural science. 2011;3(4):224. 15. Ashwini S, Shantaram M. Preliminary phytochemical and biochemical composition of different solvent extracts of red seaweed Gracilaria corticata from Surathkal beach, Karnataka in India. International Journal of Life Sciences and Technology. 2016;9(13):106-10. 16. Bano N. PHYTOCHEMICAL STUDIES ON SAPONINS AND SAPOGENINS OF GUATACUM OFFICINALE L. HEJ Research Institute of Chemistry, International Center for Chemical and Biological Sciences, University of Karachi (Karachi): University of Karachi, Karachi; 1985. 18. Seo Y-C, Yang H-C, Kim J-H, Park H-H. Volume Reduction Ratio and Decontamination Factor of the Bench Scale Radwaste Incineration Process. Nuclear Engineering and Technology. 1989;21(4):321-31. 19. Stiti N, Hartmann M-A. Nonsterol Triterpenoids as Major Constituents of Olea europaea. Journal of Lipids. 2012;2012:13. 20. Ghanbari R, Anwar F, Alkharfy KM, Gilani A-H, Saari N. Valuable Nutrients and Functional Bioactives in Different Parts of Olive (Olea europaea L.)—A Review. International Journal of Molecular Sciences. 2012;13(3):3291-340.